The Crocker, long considered one of the cultural gems of the western United States, is the longest operating public art museum west of the Mississippi River. Like many American art museums, it started with a collection housed in the Victorian mansion of a 19th century millionaire, in this case Edwin Crocker. In 1885, his widow presented the collection of California art, 700 European paintings and 1,000 master drawings by such artists as David, Durer and Rembrandt as well as a gallery building and grounds to the City of Sacramento. Since then the Crocker has acquired major concentrations in historic and contemporary American art, with an emphasis on work by California artists. As the museum grew, it renovated the Crocker’s original mansion in 1924 and added a Brutalist style building in 1969. In the last expansion during the 1980’s, Edward Larrabee Barnes revamped the interior of the mansion to create a modern exhibition space and introduced a pavilion link between the two historic buildings that includes an octagonal exhibition gallery. 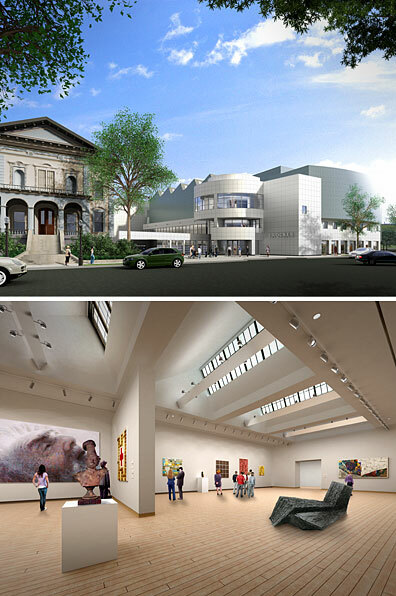 The Gwathmey Siegel Kaufman design sets off this ensemble with a three-story addition that links to each of the existing buildings except the1969 addition, which is being replaced as part of the project. Located on the west side of the gallery building, it stands prominently forward at the front corner of the site with a new courtyard between the old and new structures. Signaling the City of Sacramento’s interest in the project, city officials gave the museum permission to move Second Street, which borders the museum’s west side, 100 feet, affording the appropriate site area for both the courtyard and addition. The new building will introduce a two-story main entrance, museum store, café and reception area which opens out onto the courtyard. Also included are a 300-seat auditorium, public meeting rooms, education galleries and classrooms, art storage space and offices for administrative, curatorial and education staff. All of the administrative, meeting, educational and retail spaces are located on the first two floors. Galleries occupy the entire third floor in both the new and existing buildings. They include large, flexible, 18-foot-high volumes that can accommodate large-scale contemporary art. North-facing clerestory skylights extend across these spaces, giving the roofline a distinctive silhouette.